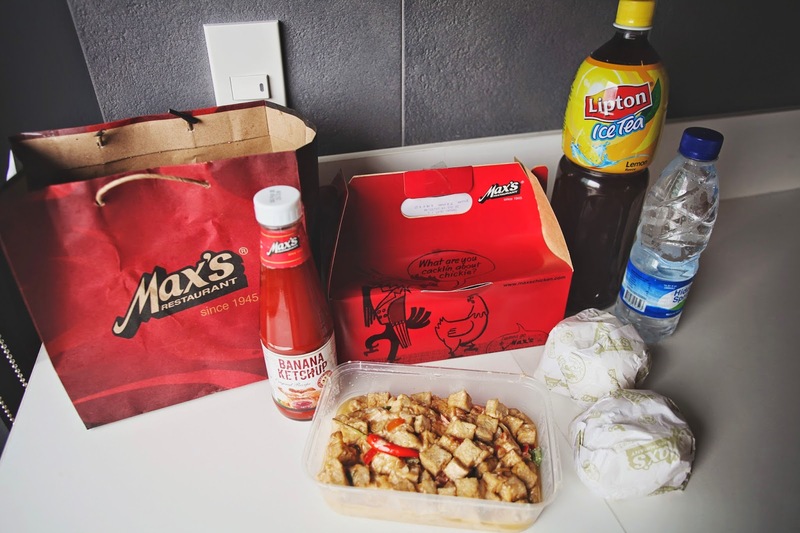 I'm really glad I live in a country (read: Philippines, Proud Pinoy) with both world class basketball team and online delivery of the world class chicken from Max's Restaurant. Max's Restaurant, the official restaurant of Team Gilas Pilipinas, continues to drum up support for these modern-day heroes as Gilas Pilipinas inches closer to the most awaited and prestigious competition in Spain slated for August. I'm a huge basketball fan and I'm joining Max’s Restaurant in supporting Gilas Pilipinas in the FIBA World Cup! As my way of supporting Gilas Pilipinas, I ordered Gilas Favorite Delivery Treat for today's lunch. 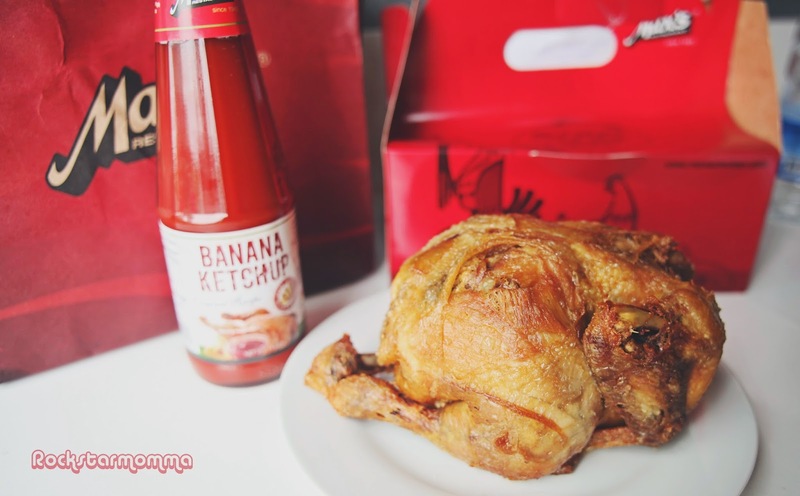 It's an offering of one whole Max's sarap to the bones fried chicken with a free bottle of banana catsup and a limited edition Gilas Pilipinas Eco Bag for only PhP299. 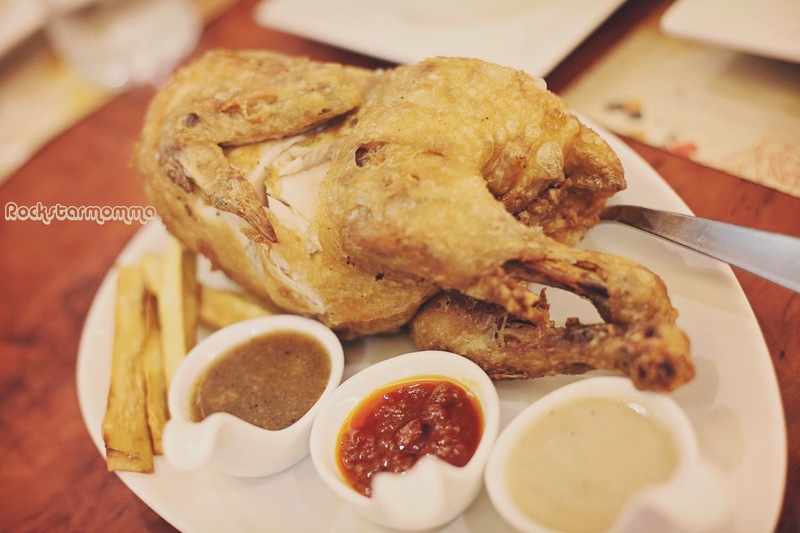 Max's and Gilas fans may now share the thrill of watching their favorite basketball team while enjoying Max's world famous, crispy-on-the-outside-and-tender-on-the-inside fried chicken. 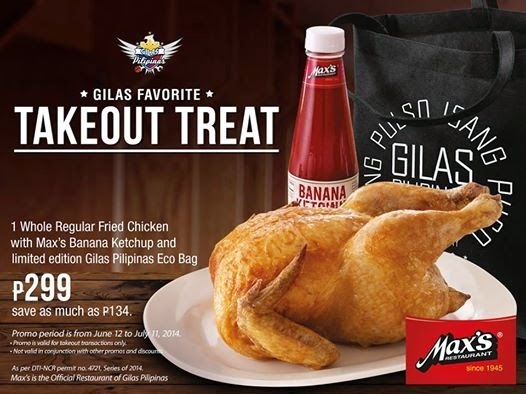 Max's Gilas Favorite Delivery Treat is valid until July 31, 2014 for both online and delivery transactions anywhere in the Philippines. I also ordered my favorite dish that I never fail to ask for whenever I eat at Max's Restaurant, the Sizzling Tofu. It is served with tofu cubes, chopped onions and red and green bell peppers, glazed with a special sauce and topped with chilies. It's definitely my comfort food. Yum! Coinciding with Max's Gilas Favorite Delivery Treat, Max's announced the winner for its "Dito Galing and Gilas" campaign. All set to fly for Spain are the lucky winners Pauline Vislenio and Jennifer Tayag Dueñes who will both be given a once-in-a-lifetime chance to watch Gilas Pilipinas compete live against the world's best basketball teams in the world. Also, have you tried Max's Pinoy Style Fried Chicken with the new three dipping sauces? Whenever I go to Max's Restaurant, I always make sure to get my special sauce ready, you know the drill. I simply mix the Banana Ketchup, the Worcestershire sauce and some hot sauce on a saucer. There's something about that golden chicken goodness smothered in a mix of sauces that gets me, every time. With Max's new chicken dips, I can try something new and I can try all three! When I ordered Max's Pinoy Style Fried Chicken, I was asked by the waitress if I wanted to have Max's gravy (just add Php10), Chili Sauce (add Php15) or Pinoy Sarsa (add Php15). All of them are tasty and delicious but my favorite is the Chili Sauce! Try it! With the hashtag #PusoToTheMax, let's continue to express our love and support to the Philippines team that has made it to the FIBA World Cup after 35 years. Get your Max's Gilas Favorite Delivery Treat while they last! Follow @maxsrestaurant on Twitter and maxschicken on Instagram and keep using the hashtag #PusoToTheMax. I would love to try this out soon! Yum!